Did you know that Park Bo Gum is as old as James Reid? If there's one thing Korean stars and our local celebs have in common, it's that they all age. Some look younger than they actually are—like an actress in her mid-20s passing for a high school student. Others, on the other hand, look more mature, which makes them perfect for those youth-to-adulthood TV series and movies. Unless you did some intense sleuthing, you'd never guess some of our fave Pinoy celebs are the same age as our K-Drama idols. Park Bo Gum and James Reid are both 24 years old. The former was born on June 16, 1993, while the latter was born on May 11 of the same year. 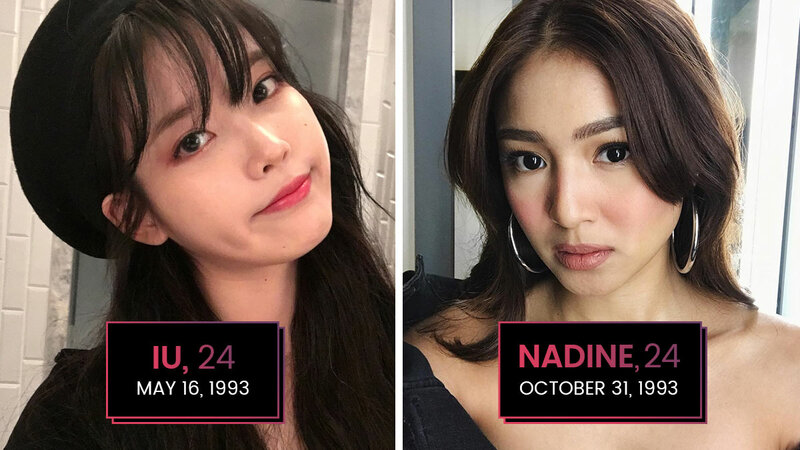 1993 was also the year when IU (May 16) and Nadine Lustre (October 31) were born. Three huge celebs with K-Pop roots, namely Bae Suzy (October 10), Krystal Jung (October 24), and Hyeri (June 9), are all 23. Julie Anne San Jose (May 17) was also born in the same year as they were (1994). Rain, Lee Joon Gi, Zanjoe Marudo, and Polo Ravales are all 35. Their birthdays are June 25, April 17, July 23, and June 27, 1982, respectively. Born in 1982, Yoo In Na (June 5), Iza Calzado (August 12), and Jodi Sta. Maria (June 16) are all 35, as well. Lee Dong Wook (November 6) and Coco Martin (November 1), who were both born in 1981, are turning 36 this year. You know who's also 36 or turning 36? Song Ji Hyo (August 15), Song Hye Kyo (November 22), and Jun Ji Hyun (October 30)! They were born the same year as these actresses that almost all '90s kids would recognize: Angelika Dela Cruz (October 29), Rica Peralejo (March 7), and Assunta De Rossi (February 19). Big Korean actresses who were born in 1990 are 27 years old now: Lee Sung Kyung (August 10), Shin Se Kyung (July 29), Park Shin Hye (February 18), and Park Bo Young (February 12). Who else was born that year? Kim Chiu (April 19), Megan Young (February 27), and Rhian Ramos (October 3). It was in 1989 when big actors like Kim Woo Bin (July 16) and Lee Jong Suk (September 14) were born. Like them, Robi Domingo (September 27), Gerald Anderson (March 7), and Xian Lim (July 12) are 28 now. FYI, Park Seo Jun (December 16, 1988) is also 28 ATM. Ji Chang Wook (July 5) and Lee Min Ho (June 22) were born in 1987—the same year as birthdays of Kean Cipriano (June 11) and Jake Cuenca (December 30). In 1992, these baby-faced beauties were born: Kim Ji Won (October 19) and Coleen Garcia (September 24). These youthful-looking 25-year-olds were also born in 1992: Alden Richards (January 2) and EXO's Baekhyun (May 6).